"Frost boy," Wang Fuman, has moved into a new dormitory. 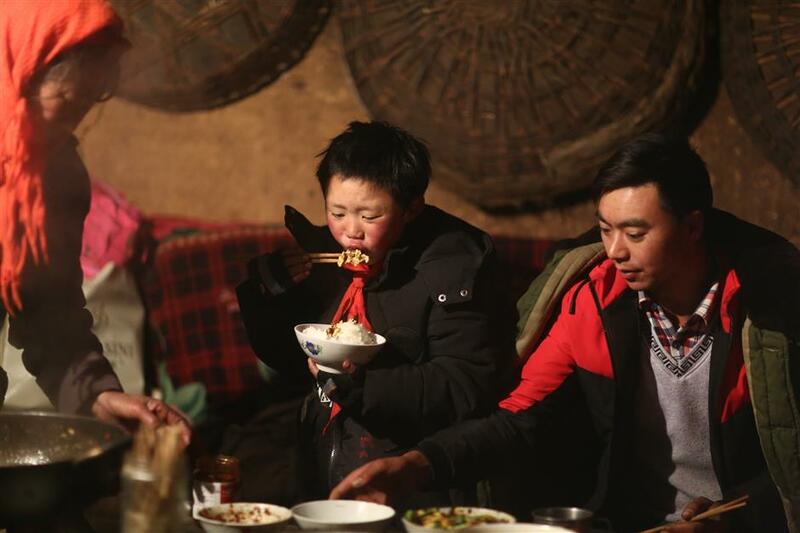 "Frost boy" Wang Fuman eats dinner with his parents at home in Ludian county, Zhaotong City, southwest China's Yunnan province, on January 12, 2017. Third-grader Wang became an online sensation in January when a photo showing him arriving at school in a thin jacket with rosy cheeks and frost-covered hair after a one-and-a-half-hour walk was posted on social media. Wang had trekked a more than 4 kilometers along a mountain path from his home to Zhuanshanbao primary school at an elevation of 2,850 meters in Ludian County of Yunnan Province on the freezing morning. At Zhuanshanbao, Wang, 8, was not the only one who had walked far. The school has 141 pupils, many of whom live over five kilometers away. Since January, the county educational bureau has pooled 800,000 yuan (US$125,000) to renovate schools like Wang's. Chen Furong, bureau director, said the money was mainly spent on school buildings, dormitories and dining rooms. "The school now has new wiring, lights, windows and doors. The ground has been hardened and the walls have been reinforced," Chen said. Electric heaters have also been installed in the dormitories, he said. Wang Fuman and his sister, Wang Fumei, will stay at school from Monday to Friday. "With the new dormitory, Fuman and his sister no longer have to walk a long way to school every day. They live well and eat well at school," said Wang Gangkui, the father.